You may already dread driving in the snow when winter returns in a few months. But before you panic about that, there’s another major hurdle we must get past: deer mating season. Keep your eyes open. Deer move quickly, so a single lapse of attention can lead to a collision. Buckle up. If you slam into a deer, you have a better chance to survive if you wear a seat belt. Don’t swerve. If a deer is determined to jump in front of your vehicle, there’s little you can do to avoid it. Swerving can make things worse if you lose control of the vehicle. Don’t agitate the deer. There’s a basis for the saying, “like a deer in the headlights.” Deer can be confused by bright lights and loud noises. For that reason, flashing your headlights or honking your horn does little to move or keep them off the road. No matter what the season, be aware of your surroundings while you drive. But that’s particularly true during deer mating season. Deer are predictably unpredictable, especially in autumn when their minds are on mating. 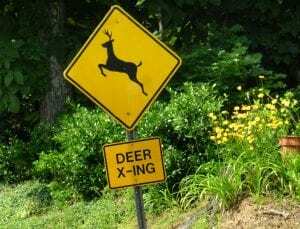 It’s up to us human motorists to stay vigilant and not put deer and ourselves at risk.